Quite an undertaking and I’m not big on decorating but this was just too much fun. Begin with the mushrooms, followed by the cake, mousse, and then ganache. Heat oven to 225 degrees. Line a baking sheet with parchment paper, and set aside. In a small saucepan, heat sugar and 1/2 cup water over low heat until sugar dissolves. Bring to a boil; cook until liquid reaches 248 degrees. (hard-ball stage) on a candy thermometer. Meanwhile, in the bowl of an electric beater fitted with the whisk attachment, whip egg whites on low speed until soft peaks form. Increase speed to high, and add hot syrup in a steady stream, beating constantly. Continue beating until cool and stiff, about 5 minutes. Beat in vanilla. Fold in cocoa powder. Spoon meringue into a large pastry bag fitted with a coupler and large plain tip. Pipe meringue onto prepared baking sheet to form 2-inch domes. Pipe a separate stem shape for each dome. Sprinkle cocoa powder lightly over meringues. Bake until dry, about 2 hours. Store in an airtight container until ready to use. To assemble mushrooms, melt chocolate in a double boiler or in a heat-proof bowl set over a pan of simmering water. Trim off points from tops of stems. With a small offset spatula, spread chocolate on underside of a cap and place trimmed end of stem into center of cap. Place mushroom, stem side up, in an egg carton to harden. Repeat with remaining mushrooms; refrigerate until set. Heat oven to 350 degrees. Butter a 10 1/2-by-15 1/2-by-1-inch jelly-roll pan. Line with parchment; butter and flour paper, tapping out the excess flour. Sift flour, cocoa, and baking soda together twice into a medium bowl. Set aside. In a small saucepan over low heat, melt butter. Skim off white foam, and pour clear yellow butter into a bowl, discarding white liquid at the bottom. Set aside in a warm place. In a medium-size heat-proof bowl, whisk together eggs and sugar. Set bowl over a pan of simmering water; stir until mixture is warm to the touch and sugar has dissolved. Remove from heat, and beat on high speed until mixture is thick and pale and has tripled in bulk. Reduce speed to medium, add vanilla, and beat 2 to 3 minutes more. In three additions, sift flour mixture over egg mixture, folding in gently with a spatula. While folding in last addition, dribble melted butter over batter and fold in. Spread batter evenly in pan, leaving behind any unincorporated butter in the bottom of the bowl. Tap pan on counter to remove air bubbles. Bake until cake springs back when touched in center, 15 to 20 minutes. Don’t overbake or cake will crack. Let sit in pan on a wire rack until cool enough to handle. Dust surface with cocoa powder. To make rolling easier, trim edges of cake, and cover with a sheet of waxed paper and a damp dish towel. Invert onto a work surface, and peel off parchment; dust with cocoa. Starting from one long end, carefully roll up cake in towel. Wrap in plastic; refrigerate until ready to use. In a double boiler, melt together chocolate and butter, stirring occasionally until smooth. Remove from heat, and transfer to a large bowl. Whisk in egg yolks, stirring well. Let cool to room temperature. In a large bowl, beat egg whites with cream of tartar until stiff. Whisk a third of the whites into chocolate mixture; gently fold in remainder of the egg whites. Whip cream until it holds soft peaks, and fold into chocolate mixture. Chill until set, about 1 hour. Place chocolate in a medium bowl. Heat cream in a small saucepan until bubbles begin to appear around edges (scalding); pour over chocolate. Let stand 5 minutes, then stir until smooth. Set aside at room temperature until cool but pourable, stirring occasionally. Make chocolate genoise and mousse, ganache icing, and meringue mushrooms. To assemble cake, carefully unroll genoise on the back side of a baking sheet (discard the plastic wrap and waxed paper, but keep the towel). Spread chocolate mousse evenly on cake to within 1 to 2 inches of one long end. Reroll cake, starting from other long end, using towel to help roll it. Cover with plastic wrap; chill until firm, about 1 hour. Place cake, seam side down, on a serving platter; tuck parchment around it to keep platter clean while decorating. Whip ganache at medium speed until it has the consistency of soft butter. Cut two wedges off ends of cake at a 45 degrees angle; set aside. 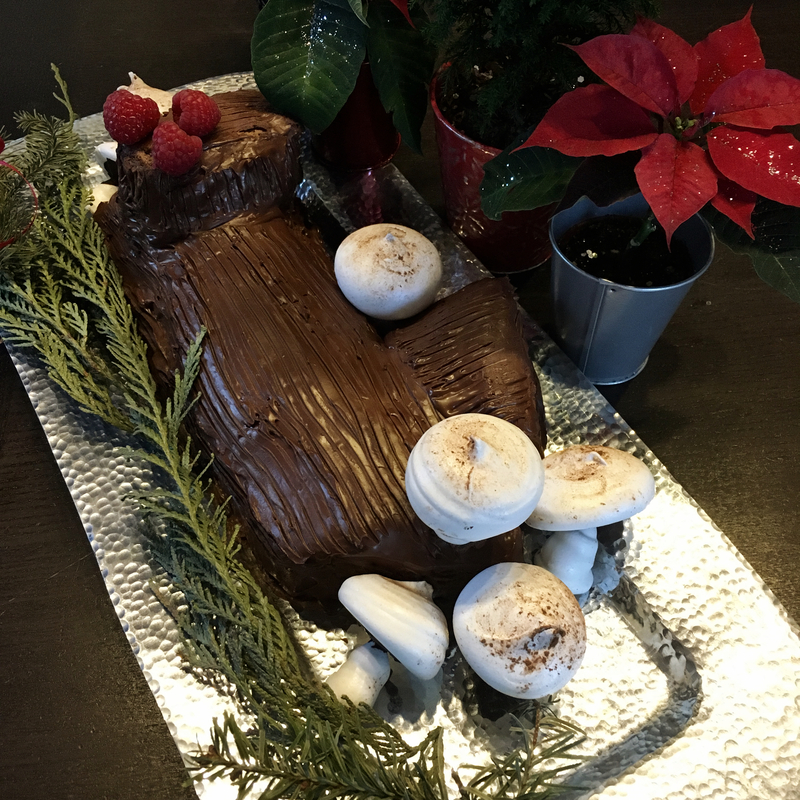 Ice log with a thin layer of ganache. Attach wedges on diagonally opposite sides of log. Spread ganache all over log, using a small spatula to form barklike ridges. Chill until ganache is firm, about 30 minutes. In the top of a double boiler or in a heat-proof bowl set over simmering water, melt chocolate until smooth. Line a baking sheet with parchment. Spread melted chocolate 1/8 inch thick over parchment. Refrigerate until cold, 10 to 15 minutes. Roll paper back and forth until chocolate splinters; sprinkle over cake. Chill cake until ready to serve. When ready to serve, arrange meringue mushrooms around and on cake, and dust lightly with confectioners’ sugar.